Many people keep some indoor plants in their houses. Most think that indoor plants are just for decorative purposes and to provide a nice aesthetic quality to the interior. But they don't know that keeping plants in house actually offers many health benefits including indoor air purification and creating positive psychological effects. Read below the health benefits of indoor plants. It has been found that the air in an enclosed house and office is more polluted than the outdoor air, posing significant risks to our health. The reason for this is not surprising. Most of the things we use indoors like furniture, paint, synthetic materials, TVs, printers and computers contribute to pollution in addition to the carbon dioxide gas that the people there produce. There are some plants that have ability to clean and purify the air, while some have other capabilities. Some of the benefits of the household plants range from removing the harmful pollutants from the air to preventing mould in bathrooms and enhancing the quality of life. We all have experienced a typical smell when we enter a house or office with new paint and new furniture. We feel same when we go to a book store. The reason for this strange smell is that there are several volatile organic compounds (VOCs) present in home and office environment. It may be pointed out that the VOCs are present not only in new houses but also in old houses. The VOCs are present in the trapped air inside the unventilated buildings and offices. These VOCs can develop asthma, cancers, allergies, auto-immune disorders and other diseases. The most commonly found air pollutants in homes and offices are formaldehyde, benzene, trichloroethylene and carbon monoxide. The chemical vapours are emitted from paint, carpet, rugs, ceiling tiles, plastics, rubber, cleaning solutions, synthetic fibres, furnitures and building materials . Cigarette smoke, cooking fuels such as natural gas and kerosene, adhesives, ceiling tiles, grocery bags, wax papers, facial tissues, rugs, pressed woods, foam insulation, paints and varnishes, glues, carpet glue and synthetic material create formaldehyde. Benzene, xylene, toluene and trichloroethylene are released from paint, paint removers, nail polish removers, varnishes, printing inks, adhesives, dyes, detergents, dyes and rubbers. Benzene is known to irritate skin and eyes. Prolonged inhalation of high levels of benzene can cause weakness, dizziness, headache, nausea, irregular heartbeat, kidney and liver diseases, blurred vision, paralysis, etc..
Also books, newspapers and other printed papers emit benzene in high concentrations. The building material adds xylene and toluene. Ammonia is generally found in offices and home office released from cleaning products, electro-photographic printers, photocopiers and biological processes such as respiration. Alcohol vapours are emitted from adhesives, carpets, cosmetics, ceiling tiles, draperies, paints, varnishes and a particle boards. Mercury vapour can also be present in house and office environment due to accidental breakage of thermometers and fluorescent bulbs; the vapour remains in the air even after the floors have been cleaned. Spending prolonged time in enclosed rooms can cause asthma, allergies, headaches and other ailments due to airborne VOCs. Following are some of the major health benefits of household plants. According to NASA research, the plants remove up to 87 percent of VOCs each day, purifying the unhealthy air by pulling contaminants into soil. Plants absorb VOCs from the air into their leaves and then transfer them to their root zone, where microbes break them down and use as a food source. Some chemicals absorbed by plants from the air are destroyed by the plant’s own biological processes. The plant’s roots take up aqueous solutions in the plant roots. Air reaches directly to plant root zone, where it can be purified. Research has also suggested that plants play a psychological role in welfare. When people are near plants, they feel relaxed and calm, people actually recover from illness faster in the presence of plants. Even one plant in the room can reduce anxiety, anger, depression, discomfort and stress. Putting plants in offices and enclosed buildings decreases colds, sore throats, coughs, flu-like symptoms and headaches and fatigue. The plants are a proven mood-booster. When we breathe, our body takes in oxygen and releases carbon dioxide. During photosynthesis, plants absorb carbon dioxide and release oxygen through the foliage. So putting plants indoors can increase oxygen levels. At night, in the absence of photosynthesis, plants absorb oxygen and release carbon dioxide. There are, however, some plants that take in carbon dioxide and release oxygen during night. Place these plants in bedrooms to refresh air during the night. Due to running of air-conditioners and heating devices, the air in the room becomes dry which reduces the humidity to a level that is not good for skin and body. If the humidity level is too low, we can develop viral infections, and when the humidity is too high eye and fungal diseases can attack us. Plants release more than 95 percent of the water they take-in into environment in the form of moisture vapour as a result of photosynthesis and respiratory processes. This process increases humidity of the air in the room. 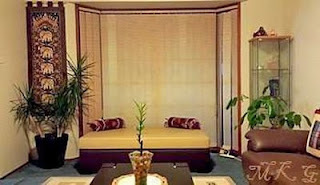 Many plants, specially the broad leaf plants balance humidity levels in the room. You can increase the humidity of a room by putting several plants in the room which helps decrease dry skin, colds, sore throats and dry coughs. Plants in the room improves attentiveness and focus of the people working there, according to a study by The Royal College of Agriculture in Circencester, England. Flowers make you creative, energetic, productive, improve idea generation and enhance problem solving ability. Indoor plants have been shown to reduce the number of sick days taken by staff and improve job satisfaction in office environments, says Dr Anthony Kachenko of at Nursery and Garden Industry Australia. High levels of carbon dioxide due to several breathing people in the room in the office can affect concentration levels. It can also cause headaches, drowsiness, light-headedness, unhappiness, etc. Looking to the advantages of keeping household plants, we all should some plants in our house. Future posts will list about 50 indoor plants with their pictures that can be placed in Living rooms, kitchen, study, home office and bathrooms. Wolverton BC, et al. Interior Landscape Plants for Indoor Air Pollution Abatement. Final Report––September 15, 1989. Stennis Space Center, MS:Science and Technology Laboratory, John C. Stennis Space Center, National Aeronautics and Space Administration (1989). Gammage RB, et al. Indoor Air and Human Health, Proc. of the 7th Life Sciences Symposium, Oct 29-31, 1984, Chelse, Michigan, USA. Wolverton BC. How to Grow Fresh Air: 50 House Plants that Purify Your Home or Office. New York, NY, Penguin Books (1997).